Shipping costs mainly depend on the size and weight of the goods you have ordered. Postage for two 120 x 75 cm pre-cuts of acoustic speaker cloth will be ¤3, for instance. If you choose cash on delivery (COD) this will incur an extra charge of ¤11 regardless of weight and size. Shipping costs mainly depend on the size and weight of the goods you have ordered. Postage for two 120 x 75 cm pre-cuts of acoustic speaker cloth will be ¤6, for instance. All prices apply to mainland delivery. Prices may differ for delivery to islands and overseas territories. 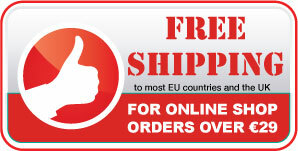 If the destination address is outside the EU, please ask us before you order to obtain a shiping quote. Please note that we do not deliver to Switzerland directly. Simply email us to obtain the contact details of our Swiss distribution partner.